If you can’t hear your friend at all, or can’t hear them very well, there might be something wrong with your playback device (speakers or headphones) or settings. If you're using your computer's integrated microphone and speakers, you might want to consider using a USB headset for better sound quality. Check out our list of best-rated devices to use with Skype. If you can’t hear anything at all from the other side, the problem is either with your friend’s microphone or with your playback device. To test that your speakers or headphones are working, try playing a song from a music player such as iTunes. If you can hear it, your playback device is working fine. The problem may be with the other person’s microphone. Ask your friend to check out our guide to solving microphone issues. If you’re using external speakers or headphones, check that they’re plugged in. Make sure the speaker volume isn’t muted and is high enough for you to hear it. Go to the Apple menu, go to System Preferences, and then selectSound. 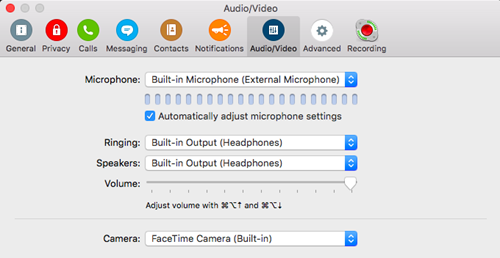 Select Output, and then choose the device Skype is using (if you only have your Mac’s built-in speakers, you’ll only see Internal Speakers) and adjust the output volume. Skype’s free test call is the easiest way to see if there’s an issue with your playback device. Type echo123 into the Search field in Skype to get started, then call and follow the instructions. We have a handy guide to explain how to make a test call. If you can hear the voice on the test call, then your audio is working fine. The problem might be with your friend’s connection or microphone. Try calling a different friend on Skype, and see if you can hear them. If you can, ask the friend whom you can’t hear to check out our guide to solving microphone issues. If you can’t hear the voice on the test call, continue through these steps to check your audio settings in Skype. In Skype, click Skype > Preferences…, and then click Audio/Video. In the Speakers drop-down, select the playback device you want to use. If you only have your Mac’s built-in speakers, you’ll only see one option in the drop-down. If you’re using headphones or external speakers, make sure you select the correct option. Check your Mac settings. If the above steps haven’t helped,use the built-in volume controls to change the device's volume. The Apple support web site can help you adjust your computer’s sound. If the audio quality is poor – meaning that you can hear the other person but their voice sounds muffled, or echoes, or drops in and out – the following tips can help. Use the latest version of Skype. We’re always improving call quality, so for best performance, make sure that you and the person you’re calling are using the latest version of Skype. Download the latest version. If the other person sounds quiet, you may need to turn your speaker volume up. Go to the Apple menu, go to System Preferences, and then select Sound. Select Output, and then choose the device Skype is using (if you only have your Mac’s built-in speakers, you’ll only see Internal Speakers) and adjust the output volume. If there are gaps or delays in the audio, it might be your internet connection (or your friend’s) causing the problem. Check out our guide to solving connection issues. Improve the sound at the other end. Ask the other person to follow the tips in our guide to solving microphone issues – there are lots of ways that they can improve the speech to noise ratio which will make it easier for you to hear them clearly.